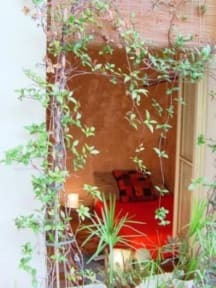 Asian Delight B&B i Roma, Italia: Bestill nå! Asian delight is a little simple but peculiar b&b of just 2 rooms, friendly managed by myself. It's an ideal place for those easy travellers who like peculiar design and vintage style.. LOOK AT THE PICTURES before booking please ! For the ones who need to have a wi-fi connection and a Mac Apple computer in their room without wasting time and extra money to find an internet point.. I take personal care of the bedclothes and towels .. I do not rent them as many b&b do.. You can smell them to realize the freshness..
- HI-FI BOSE & Jbl system with I-Pod plug in. Guests have their own keys to be free. The price is all inclusive. Please specify the correct ARRIVAL TIME in the booking form. If there will be any change or delay in your arrival time please conctact me by mail or by phone, whatsapp even. Check-in after 14.00 - 15.00 or possibly before upon request. Check-out until 11.00.. only if possible the check-out can be postponed..
Take their keys and come back at 14.00 or after. In every case if you have a late flight, you can leave your luggages here and come back later to pick them up.. This is a little self-managed b&b, not a Hotel.. The rooms have not a 'classical' style of interiors. It is not for conservative people, who have a classical conception of living..
Only for modern ones who focus on the comfort of technology and appreciate this peculiar style shown on the pictures of the rooms. If you are informal people this place can be ok,, otherwise I suggest you to book a Hotel. 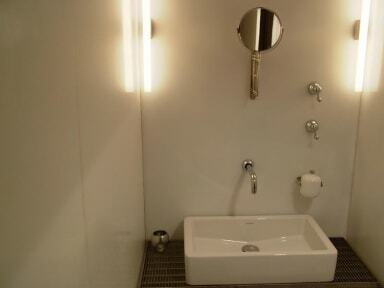 The bathrooms are quite peculiar also, being architectural prototypes, essential but full equipped. Look at the pictures please..
To get into the bathrooms there is one step. Because of this step my place is not good for wheelchair people or for the ones who have difficulties in deambulation..
A short walk from the Colosseum, Foro Romano, Palazzo delle Esposizioni, Mercati Traianei, Domus Aurea, Campidoglio.. It is an ideal place to start to explore the city.